Native to South American freshwaters, the Jaguar Cichlid (Parachromis managuensis) is as aggressive as its name suggests. For this reason, one must be careful not to put them into a tank with smaller species; it will attack them. During the breeding period, their aggression is heightened and they may even attack larger species. Providing a separate tank during breeding, or at the very least a tank partition will be beneficial to your entire fish population. The Jaguar Cichlid can live for 15 years and males can reach sizes over 12 inches. Females will rarely exceed 12 inches in size, but these fish will need a relatively large aquarium, not less than 180 gallons if breeding or kept with other fish. Water temperatures should be kept between 77F and 97F with a pH level between 7.0 and 8.7. If you want a Jaguar cichlid and you want to reduce it's aggressive behavior (which you can only do to a certain extent) then replicating their natural environment and water chemistry is a must. When I say natural environment, I mean the substrate of their habitat, the plants that are found in their favorite swimming areas, the types of rocks or driftwood and even the pace of the current. You can add a current to your aquarium by installing special jets with an adjustable flow-rate. Water chemistry includes pH, water temperature, water hardness and water clarity. As a predatory fish, the Jaguar Cichlid prefers live food but may be trained to consume pellets as well. These fish reach maturity when they are about 4 inches in size and at this point are ready to breed. Males will lose the stripes on their body when mature. In keeping with their aggressive nature, males may become violent even with the females when breeding so it may be necessary to divide the tank in a way that the female may reach the male, but not vice versa. You can do this by installing a plastic divider in the aquarium. The divider needs to have one or two holes that are big enough for the female to swim through, but too small for the male to fit. This will allow the female to interact with the male when she wants to and swim away to protect herself when she needs to. 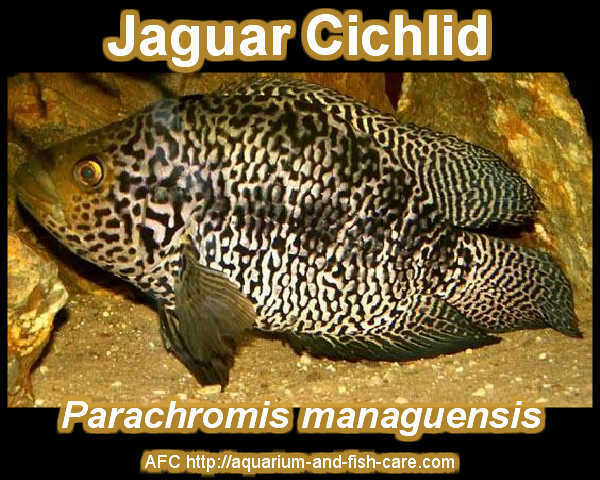 Jaguar Cichlids double in population every 1 to 4 years and are sought after for food and trade alike. Be sure you can accommodate the special needs of a Jaguar Cichlid before you make the decision to add them to your aquarium. Parachromis managuense has a bad reputation, just like many of the other large predatory cichlids. This reputation is largely undeserved, and besides, the positive sides of these fishes more than make up for any negative ones. Not to mention that an adult P. managuense is incredibly beautiful. I've kept these cichlids and have nothing but good to say about them as long as you have an aquarium large enough to handle this species that grows to 55 cm/22 inches. I would say that the absolute minimum to keep these cichlids together with other cichlids is a tank of 540 litres/120 gallons. And that's a minimum; a larger aquarium is preferable. Large specimens require even larger aquariums. They can be bred in aquariums that are at least 250 litres/55 gallons. The aquarium should be decorated so that natural territory boundaries are created and so that there are a lot of hiding places for the female, as the male can be quite mean to her if she isn't ready to breed when he is. Larger rocks should be placed directly on the bottom of the aquarium since this species digs a lot and can move large stones. Use silica to glue caves and stone formations together so that they don't fall down. This species hasn't got any bigger demands and thrives in most water conditions as long as pH and DH levels aren't too extreme in either direction. P. managuense can be kept with other cichlids from the region as long as they aren't too small and can stand up for themselves. This is true for most cichlids species from Central America. P. managuense can be aggressive, but in my experience their aggressiveness is greatly exaggerated and P. managuense leaves most fishes alone. However, during breeding they will protect their young and their territory furiously, and since they are quite large they can claim large territories especially if normal boundaries aren't created in the aquarium. But I wish to stress that P. managuense normally isn't that aggressive and doesn't beat other fish to death. Just don't keep them with fish small enough to eat (except for Ancistrus which usually survive despite their small size). Feeding P. managuense is easy and they accept just about any food. I recommend feeding them a diet of pellets, shrimps and fish bits. To vary the diet I sometimes feed them live feeders, usually convicts since it seems that one always have spare convicts one can't get rid of by selling or giving away. I usually feed my P. managuense twice a day with the occasional week without food. Sexing P. managuense is usually easy and follows the line of most other cichlids. Females are smaller and rounder. Breeding P. managuense is according to my experience also easy as long as you give them their own aquarium. Breeding them in aquariums with other cichlids is harder, but not too hard. The biggest problem is deciding what to do with and how to raise the very large number of fry. Each spawning can generate up to 2000-3000 fry. Spawnings are usually 4-7 weeks apart. They usually lay their eggs on a rock or root that has been carefully cleaned, and then dig very big craters right down to the glass bottom in which to keep their young. The fry are small but accept most kinds of food. The parents will spit out pellets that they've chewed into tiny pieces for the fry to eat. The growth rate I mentioned above is based on my own experiences when I feed only pellets. However, I don't recommend you to rely too heavily on the parents chewing food for their young. You might observe whether the fry get the food they need this way, but if they don't I recommend you feed the fry if you want them to survive. Raising the fry without their parents is much harder and I wouldn't recommend separating fry unless it's absolutely necessary. If possible, it's better to wait a few weeks until the fry have grown a little. If you like predatory fish and are willing to take my word that most of its reputation is undeserved, then I recommend you to try this very beautiful fish.